The ADS7826 27/29 is a family of 10/8/12-bit sampling Analog-to-digital converters (A/D) with assured specifications at 2.7-V supply voltage. It requires very little power even when operating at the full sample rate. At lower conversion rates, the high speed of the device enables it to spend most of its time in the power down mode?the power dissipation is less than 60 W at 7.5 kHz. The ADS7826 27/29 also features operation from 2.0 V to 5 V, a synchronous serial Interface and a differential input. The reference voltage CAN be set to any level within the range of 50 mV to VCC. Ultra-low power and small package size make the ADS7826 27/29 family ideal for battery operated systems. It is also a perfect fit for remote data acquisition modules, simultaneous multichannel systems, and isolated data acquisition. The ADS7826 27/29 family is available in a 3 x 3 8-pin PDSO (SON, same size as QFN) package. This is one package pinout of ADS7829,If you need more pinouts please download ADS7829's pdf datasheet. 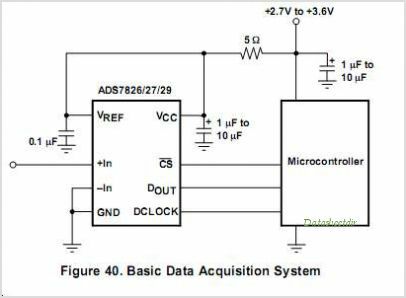 This is one application circuit of ADS7829,If you need more circuits,please download ADS7829's pdf datasheet.